We went behind the curtains of an exciting new Brazilian endeavor called Guidu and talked to the co-founder Marcus Andrade. Below you can learn about Marcus’ professional experience, how Guidu is being structured to reach over 10 million users, and advice to entrepreneurs all over Latin America. The desire to become an entrepreneur came during college. Marcus was a business management student with a clear objective in his mind, but he knew that to overcome the challenges of entrepreneurship he would need a solid professional experience. Doing an internship at Ashoka, an international NGO focused on supporting innovative social entrepreneurs; handling mergers and acquisitions as a strategic planner at Telefonica, telecom giant; having a 4-year-experience at Endeavor analyzing, selecting, and supporting the most innovative entrepreneurs in Brazil; and lastly running a company in the medical industry with over 100 employees for one year did an amazing jog at setting Marcus off for a great start, as he partnered with former general director at Endeavor, Paulo Veras, to build Guidu. “The experiences I had helped me understand what my daily routine would be like [as an entrepreneur]”, said Marcus. Guidu comes from the English phrasing “Guide You”, revealing its very clear concept of being and online collaborative guide. Users on Guidu can shares tips and reviews of bars, restaurants, clubs and movies, making it a fun, easy and social way to discover things to do. and the observation that people already exchange recommendations of places to go and movies to watch in the offline world. Of course the fact that Marcus is a passionate and compulsive guide reader didn’t hurt. Being constantly sought after by his friends to give tips on nice places to go probably helped spark the idea for Guidu. 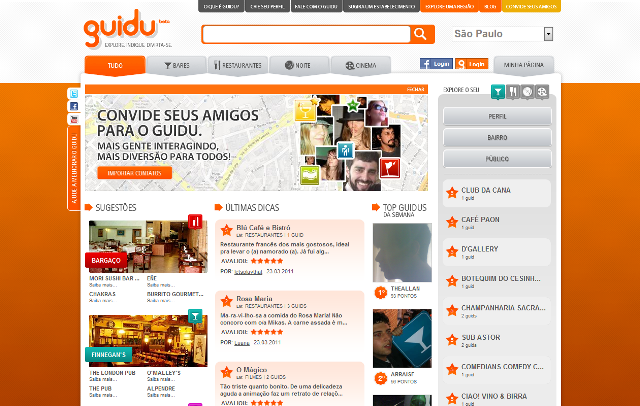 Guidu was released in October 2010 in São Paulo and recently added Rio de Janeiro as a participating city. The guide has over 2000 registered users, who are able to contribute with tips about places and movies, and 45000 unique visitors per month, who are passive viewers of the website. They are aiming to reach 500.000 unique visitors by the end of 2011 and believe there is potential to attract up to 10 million unique visitors. At the end of each month an offline event is organized where the top 40 most active users of Guidu are invited for a happy hour, giving them a chance to meet in person their fellow Guidus. Every city where Guidu is available begins with an initial database of establishments. An internal team collets basic information, such as address, phones, website, forms of payment, pricing, type of food, and others, so that users can suggest additional information and request the inclusion of other establishments. You can find over 6000 establishments on Guidu, and this number will continue to grow as it becomes available in other cities. By the end of 2011, the social guide should be available in 15 cities. Reactions from owners have been very positive, with an appreciation for having their business displayed on the guide. “Many owners don’t know exactly how to get their business on social networks, so they are seeing Guidu as a way to participate and have their services evaluated”, explained Marcus. Marcus and Paulo initially invested R$2 million (approximately US$1.2 million) and are now preparing to a first round of external investment. Return over investment is expected to be achieved with advertising on the site, using the traditional format with banners on the website and developing some innovative advertising initiatives in partnership with large consumer companies, creating interactions that start online with Guidu and transition to the offline world. Word of advice for entrepreneurs in all Latin America: start doing! Marcus points out economical stability, the beginning of a reinvestment culture among the new generation of entrepreneurs and abundant capital as opportunities to start your business. Be ethical. There are shortcuts that may seem like the easier path, but will ultimately result in problems that will destroy years of hard work. No one better than Jorge Paulo Lemann, the 48th richest person in the world, to teach this lesson. He says that thinking big or small is the same amount of work, so think big and do something that will change the world. Lemann serves on the Board of Directors of Endeavor Brazil office. Twestival en tu ciudad: ¿te involucras con las causas on line?